Ladies: your hearts are different from your brother's, father's and grandfathers'. The American Heart Association wants to be sure women and their doctors understand that women often have different underlying causes and symptoms of heart attacks than men. When their symptoms are not spotted and treated early, they can be life-threatening. The first scientific statement from the American Heart Association on heart attacks in women, published in the journal Circulation, also says black and Hispanic women are even more at risk for heart attacks and have poorer outcomes when they do have one. "Despite stunning improvements in cardiovascular deaths over the last decade, women still fare worse than men and heart disease in women remains under diagnosed, and undertreated, especially among African-American women," the AHA's writing group chair Dr. Laxmi Mehta, a noninvasive cardiologist and director of the Women's Cardiovascular Health Program at The Ohio State University, said in a statement. Cardiovascular-related deaths have dropped among women overall, thanks to better prevention strategies and treatments, but an estimated 6.6 million American women still suffer from coronary heart disease and it remains the leading cause of death for women in the U.S.
Heart attacks are caused by blockages in the main arteries leading to the heart. In women, experts say the way the blockages form a blood clot may differ than what's traditionally seen in men. Women may have less severe blockages that don't require stents, but suffer more damage to the coronary artery blood vessels and that can lead to decreased blood flow to the heart muscle and result in a heart attack. The risk factors linked to heart attacks are often overlooked in women, said Dr. Suzanne Steinbaum, director of Women's Heart Health at Lenox Hill Hospital, in New York City. Steinbaum said black women are especially vulnerable. "We're seeing a real increase in risk factors in younger women and more African-American women. The outcomes are so much worse," said Steinbaum. "In the premenopausal population, in fact, incidence has increased and women of this age often do worse." It's especially important for women in higher risk groups to be screened for diabetes and high blood pressure since those conditions are more strongly associated with heart attacks in women, said Steinbaum. The report said that for a young woman who has diabetes, her risk for heart disease is four to five times higher compared to young men. Steinbaum said depression can also be a risk factor for heart attacks and it's often overlooked. "So many times I think we separate the neck up and the neck down," she said. "Depression can be a risk factor that is really important." Compared to white women, black women have a higher incidence of heart attacks in all age groups, Steinbaum said. 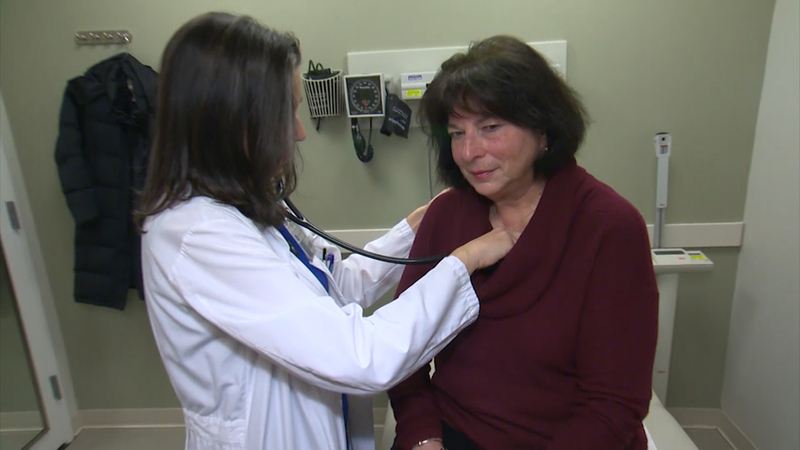 "Most women will have some kind of discomfort in the chest when they are having a heart attack, but it may not feel like they expect it to feel," Dr. Harmony Reynolds of NYU Langone Medical Center told CBS News. "But there is usually discomfort somewhere in the chest area, and/or in the neck, the jaw, the back, the upper stomach, it can even be in either arm or shoulder." That was the case for Marsha Goodbaum, who suffered a heart attack three years ago. Her symptoms were nausea and stomach pain, and she didn't go to the hospital until hours later. "I had no idea I was having a heart attack," she said. "I really expected shoulder pain or heavy chest pain." When it comes to treatment for heart problems, women are generally undertreated compared to men, the AHA statement said. "Men and women may benefit from the same medications, but because women's disease is more subtle, they may be misdiagnosed and not be treated as often," Steinbaum said. And women face greater complications from attempts to restore blood flow because their blood vessels are often smaller, they tend to be older and have increased rates of risk factors, such as diabetes and high blood pressure. Rehabilitation after a heart attacks is also prescribed less frequently for women, and even when it is prescribed, women are less likely to participate in it or complete it, the report said. Racial disparities are even worse after a heart attack: black women have higher in-hospital death rates, and compared to white women, black women are less likely to be referred for important treatments such as cardiac catheterization, according to the statement. "Women should not be afraid to ask questions. We advise all women to have more open and candid discussions with their doctor about both medication and interventional treatments to prevent and treat a heart attack," Mehta said. "There's a void and a need. Women need to understand that their hearts are different, their treatments are different. Finally, the medical establishment is noting that maybe we have to be more aggressive about taking care of our women," Steinbaum said.